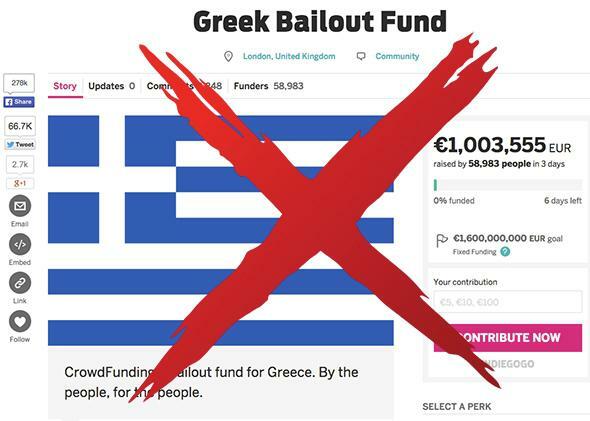 That Greece-bailout crowdfunding campaign may not be a scam, but that doesn't mean you should contribute. Don’t give money to the Greek crowdfunding campaign. Screenshot and illustration by Slate. Image by Nanashiro/Shutterstock. Tuesday night, the crowdfunding platform Indiegogo took to Twitter to announce that an active campaign was so popular, it had overwhelmed the site’s servers. The project in question was a self-described “Greek Bailout Fund,” an attempt to “sort” Greece’s massive debt through the independent generosity of the European Union’s 503 million private citizens. As of Wednesday morning the campaign was back online and had raised a little more than $1 million. That’s an impressive amount, albeit one that falls far short of the campaign’s goal of almost $1.8 billion. Should you help it go the distance? Absolutely not. Crowdfunding can be a powerful tool. It’s terrific, for example, if you want to fund a retro video game. And it’s great if you have a seductive gadget that you can’t produce through traditional means. The most successful projects have raised tens of millions of dollars, unsettling—if not fully upending—more traditional investment systems. So far, however, none have come close to the ambitious target set by the “Greek Bailout Fund.” This campaign is unlikely to change that. “Greek Bailout Fund” was initiated by Thom Feeney, a 29-year-old who works for a London shoe store. Though he’s unaffiliated with Indiegogo, the company has enthusiastically embraced his venture, probably because, as Gizmodo’s Matt Novak observes, it’s great publicity for the company. Feeney claims on the project’s campaign page that users will have their money refunded if the campaign doesn’t meet its goal, which means that making a pledge should be relatively safe. But it’s not clear that what would happen in the unlikely event that it does surpass the $1.7 billion Greece failed to pay to the International Money Fund on Tuesday. Feeney freely claims that he has “never been involved in Greek politics” and has “not yet been in touch with any European leaders” about how the money would be distributed. He likewise offers little indication as to how he would provide users with the perks—postcards from Greece, salads delivered to your door, and so on—promised to users who hit various pledge tiers. More generally, and more importantly, Feeney’s campaign is unlikely to have a meaningful impact on Greece’s real debt, which is fast approaching $400 billion. As Slate’s Jordan Weissmann points out, there’s no conceivable way a crowdfunding site “will ever raise enough money to make even a quark-sized difference in the country’s obligations.” Those hoping to make a real difference might consider supporting an underfunded Greek charity. Or maybe just ordering a gyro at their neighborhood deli.